Since we'd arrived in the dark, it was a nice surprise to wake up and find the Medora Campground to be so nicely appointed. 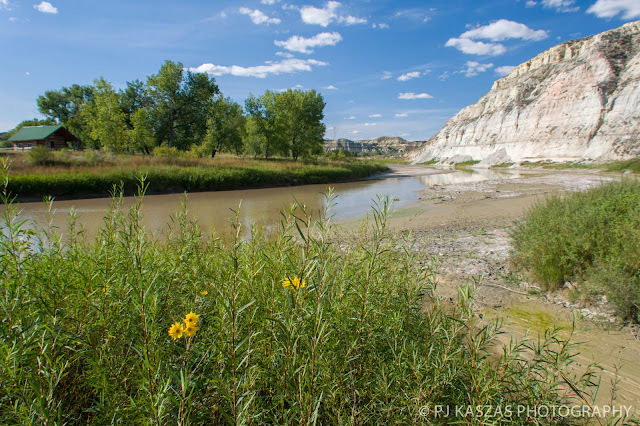 It's got plenty of trees, places to walk your dog, and trails down to get a good look at the banks of the Little Missouri River. The entrance to the south unit of Theodore Roosevelt National Park (TRNP) is also just down the road. We started out at the visitor's center and then drove out onto the loop road. TRNP are a protected stretch of badlands, surrounded now by ranching and oil concerns. The earth is craggy and naked beneath grasslands, a geologist's dream. 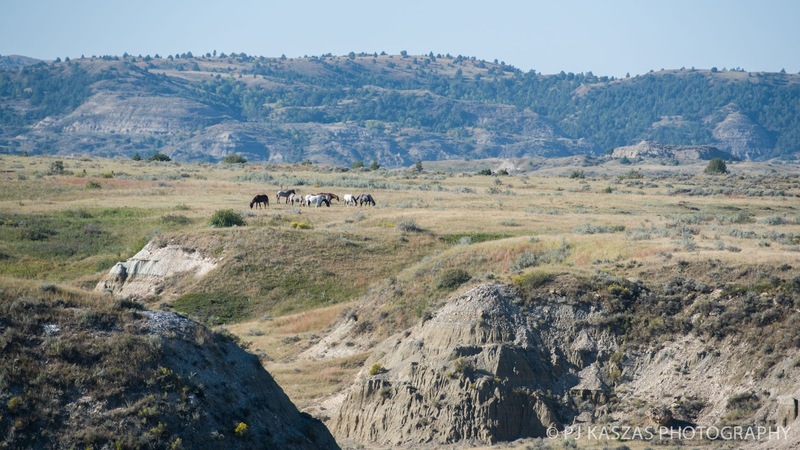 It was here in the 1880's that Theodore Roosevelt established two ranching concerns in what was still the Dakota Territories. 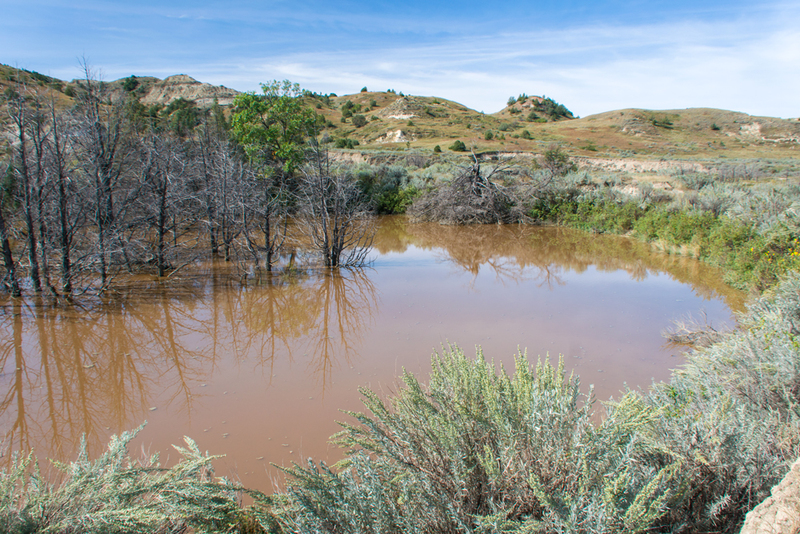 Around the same time, a French nobleman, the Marquis de Mores, founded the town of Medora, naming it after his wife. The two didn't exactly get along but both men helped shape the history of this region. But long before the arrival of these lofty personages, this was the land of the Mandan, Hidatsa, and Crow. In the late 1800's war came to this area as the U.S Army and the Sioux clashed. 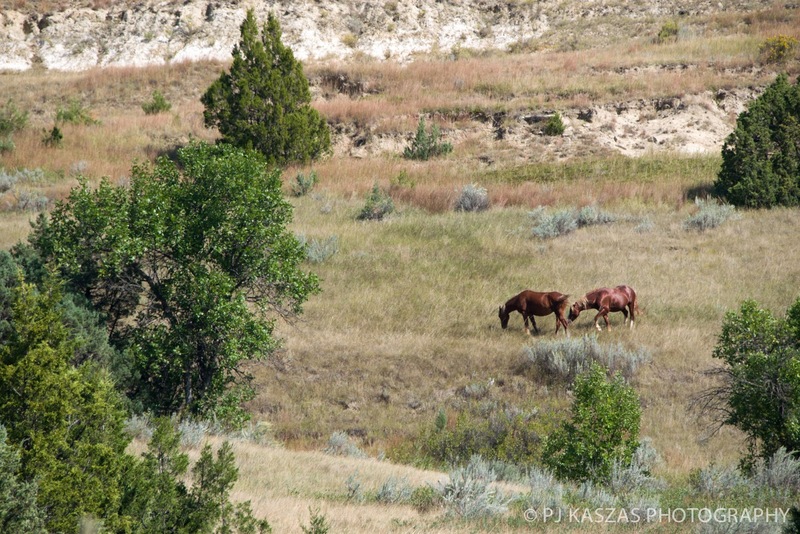 Today Medora is better known for its musical and TRNP is one of the few national parks that wild horses can call home. 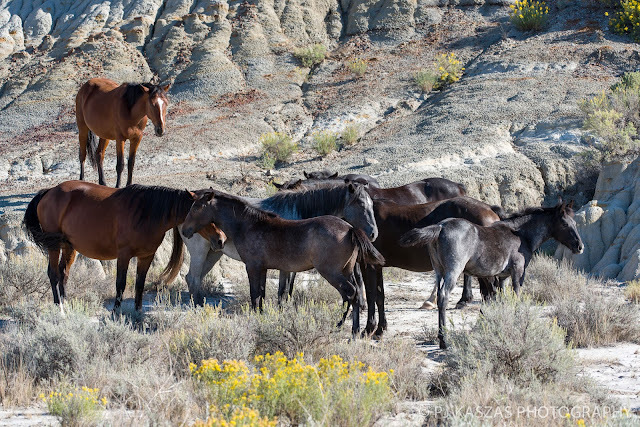 Wild mustangs roamed here for hundreds of years. 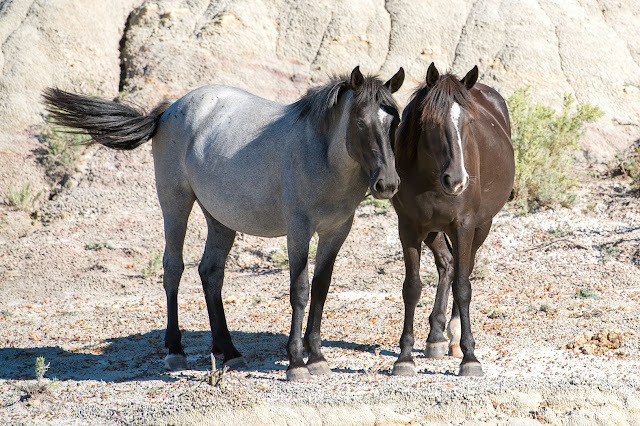 Native peoples' horses were released or displaced during clashes with the U.S army. The ranchers, of course, brought their own horses. 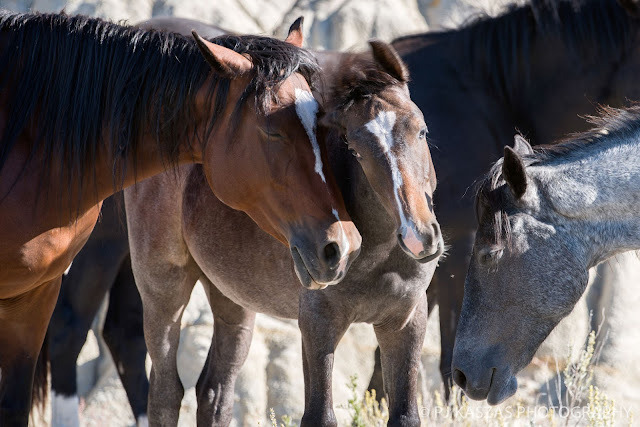 When cars and tractors replaced horses, and harsh conditions drove many to seek employment elsewhere, these horses were abandoned. 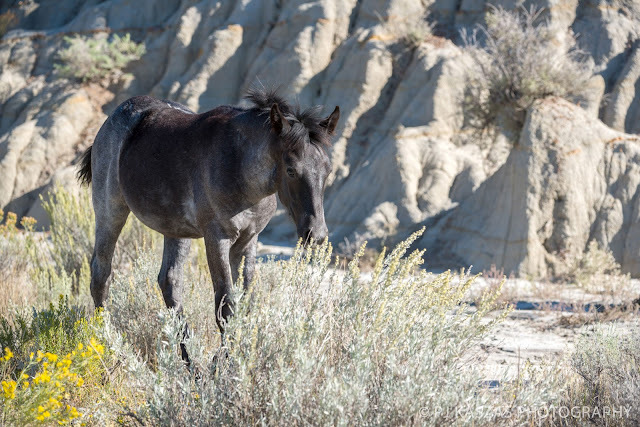 The horses of TRNP trace their roots back to these wild mustangs, Native American horses, and the many breeds brought by European settlers. 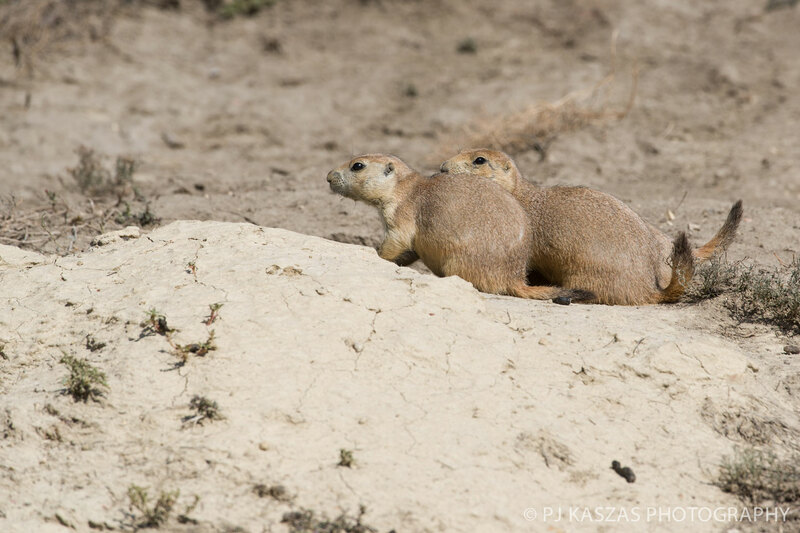 TRNP also boasts a huge population of prairie dogs. Seen from afar their holes make the land look like the cratered surface of the moon. We would also see a solitary buffalo here and there and the occasional solitary pronghorn. Near the Boicourt overlook. Thirteen surveying the badlands. 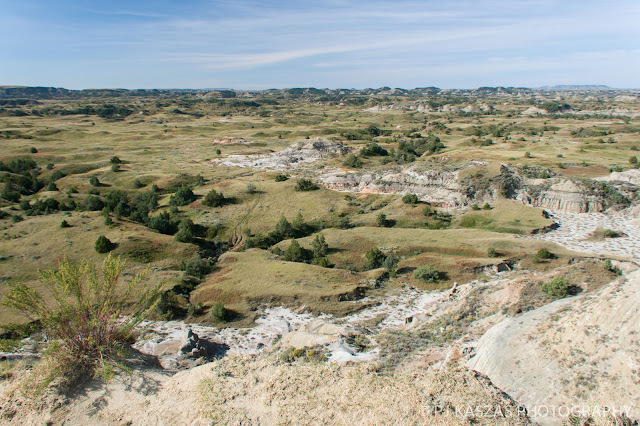 The badlands of TRNP. Notice the well worn game trail on the left. We would quickly determine that searching for wildlife in the craggy, rough land of these badlands was sometimes very difficult. Manure and footprints were in abundance but actually siting the animals that left them was not easy. Near the Talkington Trail head we saw two horses. I believe one was Stallion Flax. I'm not sure who the other horse was. 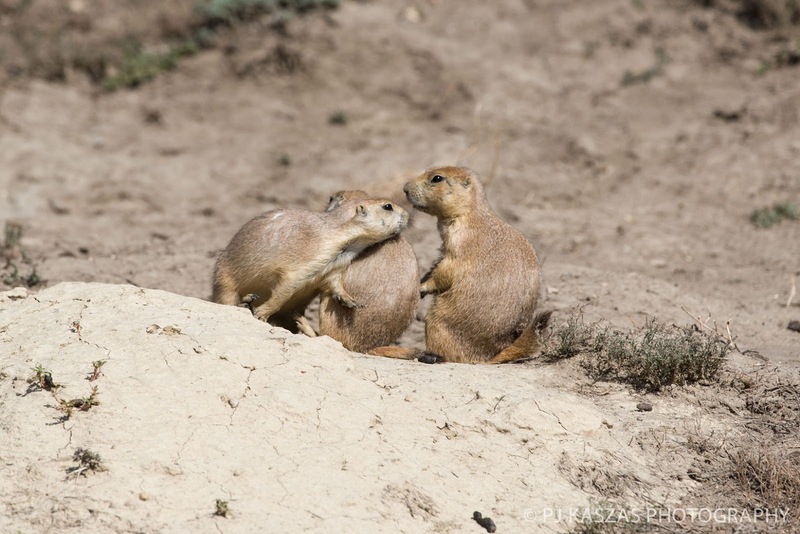 These two were on the side of the road with their heads down in scrub, eating happily away and thus making photo ops impossible. We would have liked to hike out the Talkington trail but lack of parking was an issue. We hiked the parts of the Paddock Creek Trail. There was a lot of mud. 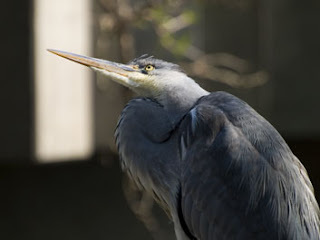 We would see Northern Flickers and Mountain Bluebirds and some rather large bird that was either a grouse or a pheasant. 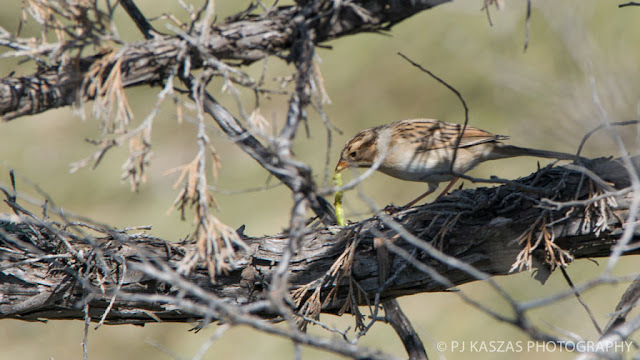 Le Conte's Sparrows darted through the low trees. Le Conte's Sparrow with lunch. 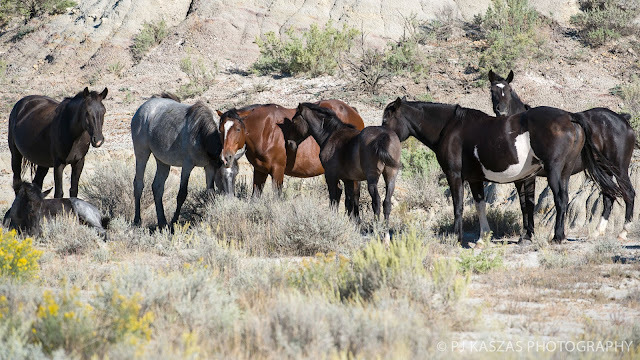 Again, we were seeing many hoof prints and plenty of stud piles but not seeing the horses that left them. When we got back to the truck, the two horses we saw earlier were up on a ridge above us. They would disappear as quickly as they appeared. 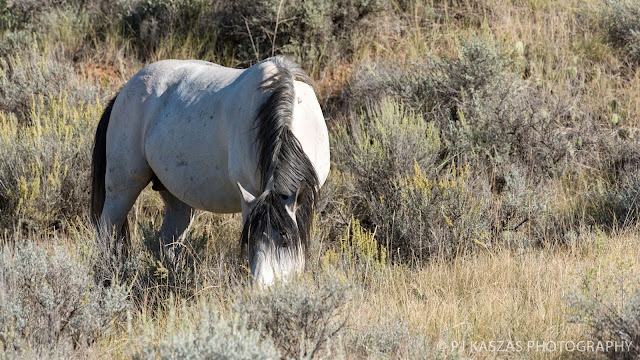 I believe this is Flax (right), a stallion. The other horse with him is his one and only mare Maggie May. He's young and still learning the ropes of being a band stallion. 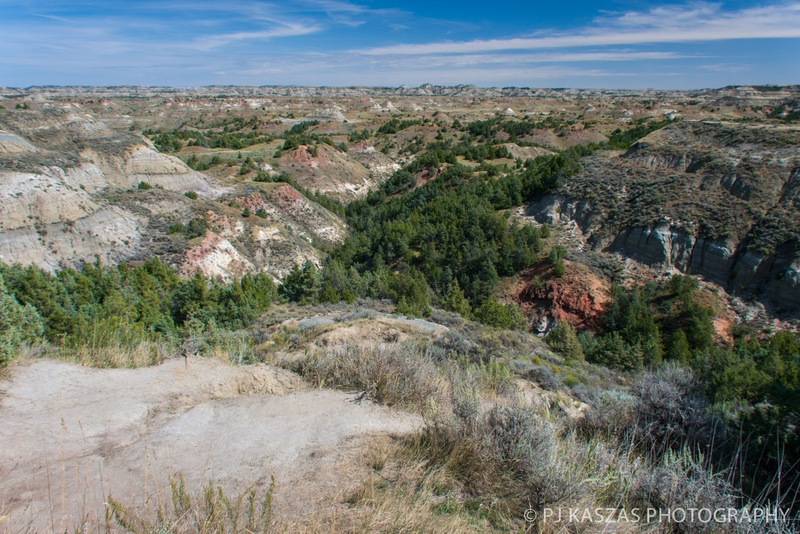 North Dakota Badlands Overlook. 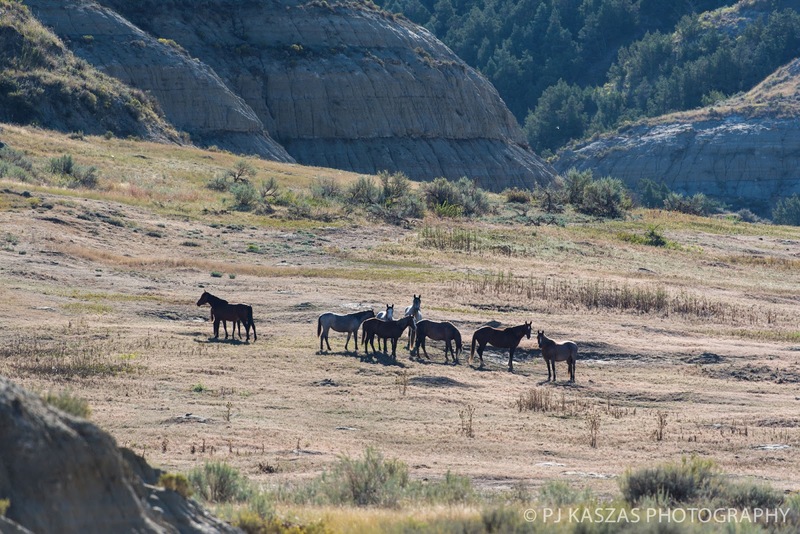 It was here, when I turned back to the truck that I noticed horses way up on a ridge near the highway. This would help us out the next day as we continued out search. Scoria tops many the hills in the badlands here. Having not done very well with our photo safari in search of horses, we returned to the campground for lunch. We did laundry. I think I may have fallen asleep for a bit. We then headed south to Sully Creek State Park to take Chena on a well deserved hike. 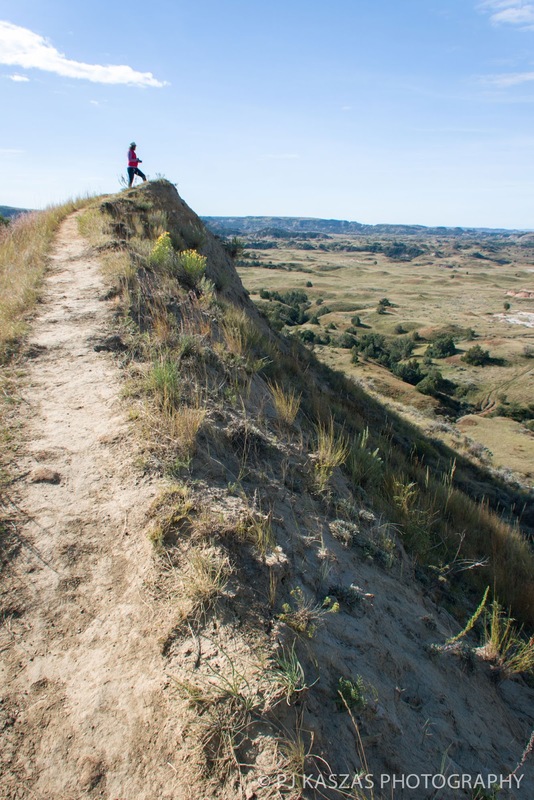 Here you can pick up the Maah Daah Hey Trail that runs from here to the north unit of Theodore Roosevelt National Park. This is best done on horseback or by bike. We would try again to photograph horses much later in the afternoon, heading out toward that ridge I'd seen horses on earlier in the day. We drove out to the Painted Canyon Visitor's Center and tried to meet up with the Paddock Creek Trail again but that proved impossible with lack of signage and the plethora of game trails. Again, we saw plenty of evidence of horses but had no luck finding them. We also wandered through several buffalo wallows and by some very fresh buffalo leavings but didn't see the buffalo that left them. We ended up hiking the Visitor's Center nature trail. Getting up close and personal with the geology of the ravines and defiles was pretty interesting. The next morning we decided to try again. This time we started with the Ridgeline Trail area where I saw the band of horses I'd caught a glimpse of the day before. I believe this is Gary's band. We'd then have many more encounters with the beautiful wild horses of Theodore Roosevelt National Park. This might be Gary's band. Gary, being the band stallion. Silver's Band L to R: Juniper, Gunnison (laying down) Dixie, Firefly, Olympic, Daisy (overo, white markings on body), Eagle. 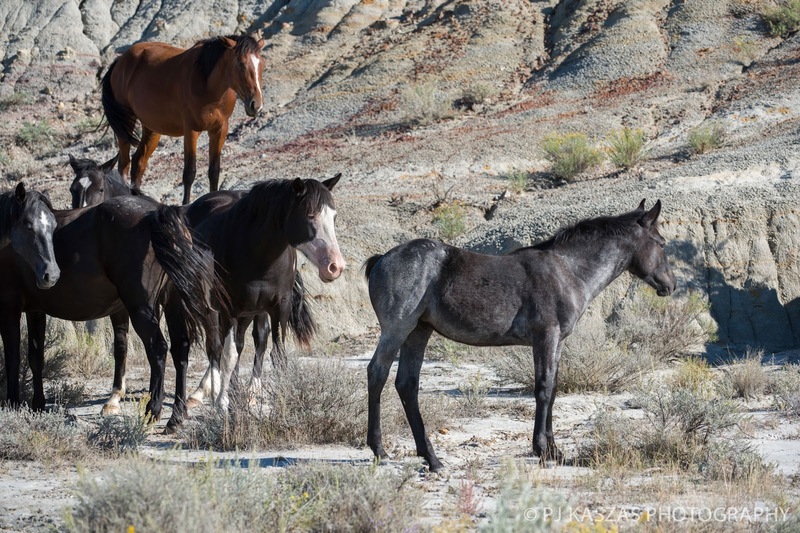 Democracy, mare, overlooking the rest of her bandmates. Gunnison. A 2015 model. Her mother is Juniper. Firefly and her colt Olympic having a moment. It was a real privilege photograph Silver's band. 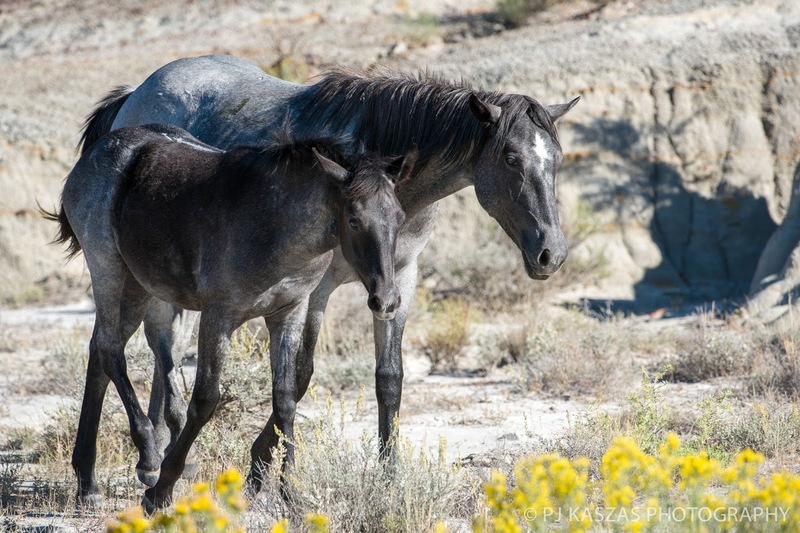 The best way to photograph wild horses is to use a big zoom lens. This way you aren't disturbing them. We did witness people getting very up close and personal with these horses. Keep in mind they are wild animals. And it is possible to fully appreciate their beauty from a farther distance. All too soon it was time to hitch the camper back onto the truck and head south. Next stop Deadwood, South Dakota.